The Rock That Is Higher Than i. ​God is The Chief Physician. He nurses us. He comes to our aid. In His timing He will see me through. You’ve kept track of my every toss and turn through the sleepless nights, Each tear entered in your ledger, each ache written in your book. I will trust in Him. CHRIST IS THE SOURCE. I heard someone say, my cup runneth over but sometimes someone runneth over my cup. To that i say, take your cup OUT OF ROAD! The Lord is here to help us with our burdens but for me personally I know I take on burdens that I don’t need to take on to begin with. Staying outta trouble to begin with is always a good thing. Not carrying burdens around is key. Letting go of burdens is a must. 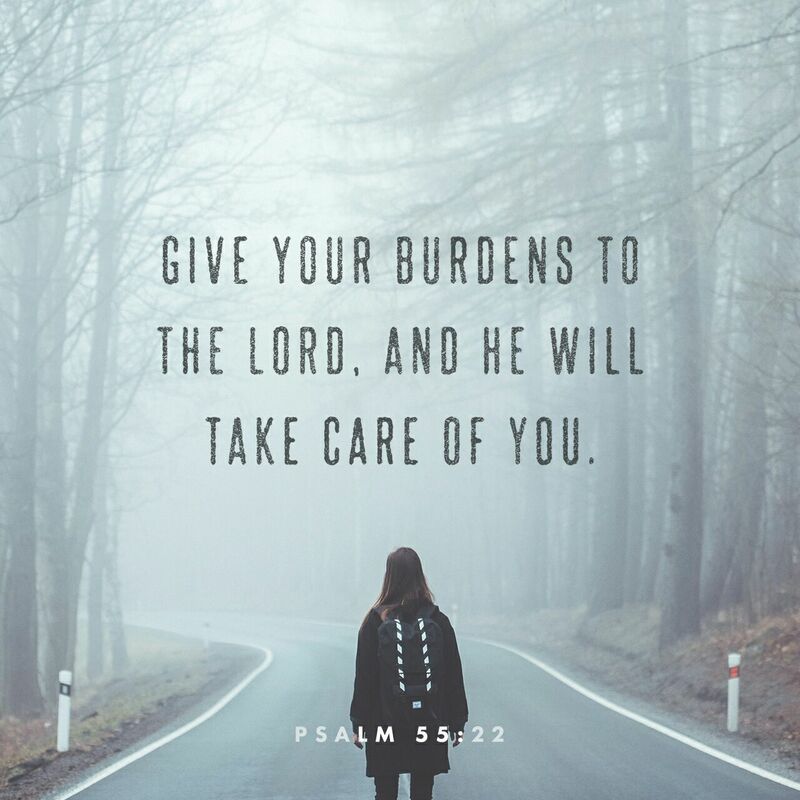 Pile your troubles on God ’s shoulders— he’ll carry your load, he’ll help you out. He’ll never let good people topple into ruin. But you, God, will throw the others into a muddy bog, Cut the lifespan of assassins and traitors in half. And I trust in you. Trying not to mourn the dead but celebrate their promotion to Glory. I miss Alexx so much but Praise our Father for making a way for us to reunite. I did a blog post a while ago called “I Wanna Be Like Samuel’s Mom”. It was about Hannah, a woman who wanted a child so bad, she even tried to make a type of bargain with God. Now there is a difference between making a commitment to God and bargaining with him. I think for her it was more of a commitment. We know as we read on she followed through on her end too. So Hannah ate. Then she pulled herself together, slipped away quietly, and entered the sanctuary. The priest Eli was on duty at the entrance to God ’s Temple in the customary seat. Crushed in soul, Hannah prayed to God and cried and cried—inconsolably. Then she made a vow: Oh, God -of-the-Angel-Armies, If you’ll take a good, hard look at my pain, If you’ll quit neglecting me and go into action for me By giving me a son, I’ll give him completely, unreservedly to you. I’ll set him apart for a life of holy discipline. Personally i am applying this Scripture in my own life…when my children (all 5 -Kyri, Olivia, Madi, Abbey and Alexx) were born i vowed that i would do my best to teach them about God and pass/share my relationship with Him with them. When a child is born it changes & effects you, so also when one dies it changes and effects you. I never thought i have to hand one of them back to God to go to heaven before me. Burying a child is so hard. However, i had no choice. My only son died last month and i watched as each of us had to deal with our loss. He was taken from this earth and even with our faith in God providing a better place it tore us apart inside. Now, i, his mother, siblings, grandparents, aunts, uncles, cousins, friends are all struggling with the stages of grief…one of those stages being bargaining. It is my prayer that we will all pledge, vow, made personal comments to God as we try to carry on. CLICK HERE 👉My Son👈 TO SEE WHAT MY SON DECIDED TO DO WITH HIS LIFE. “Every time you cross my mind, I break out in exclamations of thanks to God. Each exclamation is a trigger to prayer. Note: I’ve personally learned that there are certain things in my life that trigger me to respond or react in different ways. Some things, ‘spir’ me on in encouragement other things seem to spin me off course to the point that Christ alone keeps me from being at a complete loss in discouragement and depression. It is times like this i go back and dig into letting Christ guide me back, as a Good Shepherd guides His sheep (John 10). Each morning i seek His voice and all through the day beckon His call and nudging. I find myself praying for you with a glad heart. I am so pleased that you have continued on in this with us, believing and proclaiming God’s Message, from the day you heard it right up to the present. Note: As i take a personal inventory of my life over the years i seek where and while i was deficient and where and when i had an abundance…a double dose of the Holy Ghost, letting Him spilt out of me. I see His faithfulness even when i fall short. It’s not at all fanciful for me to think this way about you. My prayers and hopes have deep roots in reality. You have, after all, stuck with me all the way from the time I was thrown in jail, put on trial, and came out of it in one piece. All along you have experienced with me the most generous help from God. He knows how much I love and miss you these days. Sometimes I think I feel as strongly about you as Christ does! Note: personally i see clearly and identify with The Apostle Paul here too. Although i’ve not been in jail, other than to visit others, i’ve been a prisoner of my own devices and yet God nor His lovers leave me, forget me or forsake me. So this is my prayer: that your love will flourish and that you will not only love much but well. Learn to love appropriately. You need to use your head and test your feelings so that your love is sincere and intelligent, not sentimental gush. Personally, i can really only speak from personal experience, between the love I find in Christ and in those who share that same love , i find myself a truly blessed and appreciative person. I wrote this after my oldest daughter’s visit. I expressed to her how much i missed all my children. She reminded me the three younger ones, Abbey, Madi & Olivia will age quickly and before we know it visiting will be easier. Then we expressed to each other how much we missed the only boy in the family, my son Alexx, who we will not see until we join his in Heaven, reunited with our Father. But your dead will live, Lord ; their bodies will rise— let those who dwell in the dust wake up and shout for joy— your dew is like the dew of the morning; the earth will give birth to her dead. At that time, this song will be sung in the country of Judah: We have a strong city, Salvation City, built and fortified with salvation. Throw wide the gates so good and true people can enter. People with their minds set on you, you keep completely whole, Steady on their feet, because they keep at it and don’t quit. Those who lived high and mighty he knocked off their high horse. He used the city built on the hill as fill for the marshes. All the exploited and outcast peoples build their lives on the reclaimed land. The path of right-living people is level. The Leveler evens the road for the right-living. We’re in no hurry, God . We’re content to linger in the path sign-posted with your decisions. Who you are and what you’ve done are all we’ll ever want. Through the night my soul longs for you. Deep from within me my spirit reaches out to you. When your decisions are on public display, everyone learns how to live right. If the wicked are shown grace, they don’t seem to get it. In the land of right living, they persist in wrong living, blind to the splendor of God . You hold your hand up high, God , but they don’t see it. Open their eyes to what you do, to see your zealous love for your people. Shame them. Light a fire under them. Get the attention of these enemies of yours. God , order a peaceful and whole life for us because everything we’ve done, you’ve done for us. O God , our God, we’ve had other masters rule us, but you’re the only Master we’ve ever known. The dead don’t talk, ghosts don’t walk, Because you’ve said, “Enough—that’s all for you,” and wiped them off the books. But the living you make larger than life. The more life you give, the more glory you display, and stretch the borders to accommodate more living! O God , they begged you for help when they were in trouble, when your discipline was so heavy they could barely whisper a prayer. Like a woman having a baby, writhing in distress, screaming her pain as the baby is being born, That’s how we were because of you, O God . We were pregnant full-term. We writhed in labor but bore no baby. We gave birth to wind. Nothing came of our labor. We produced nothing living. We couldn’t save the world. But friends, your dead will live, your corpses will get to their feet. All you dead and buried, wake up! Sing! Your dew is morning dew catching the first rays of sun, The earth bursting with life, giving birth to the dead. Come, my people, go home and shut yourselves in. Go into seclusion for a while until the punishing wrath is past, Because God is sure to come from his place to punish the wrong of the people on earth. Earth itself will point out the bloodstains; it will show where the murdered have been hidden away. It gives a great ‘Scripture Picture’ of how God really is, how considerate and loving He is. I love how the Old Testament and New Testament point to God, not just as creator but THE creator being with His creation from the start. It’s real a blessing when you realize He stayed involved. He is a Father who kept in touch, although not in or of this world now (physically here with us) He still calls and sends us mail. For me God has the first say and the last say. He is the beginning and the end. Who better to be in charge than the creator? I will continue to seek His advice and apply what He gives. Best of all I’ve let Him make Himself at home in me. When I felt that I had no other choice than to divorced myself from my children’s mom I recall crying out to God, thinking He couldn’t understand…I heard him whisper to my soul, “My child, I was Physically there on earth But I also separated myself from mother earth. I still keep in contact with all my children, you’ve got letters to read (My word) and I call to your heart directly. Listen. Someday we will be reunited. ” (John 14). As I did that and revisit that book this is what I see.. I share this post in hope that others will enjoy and share the same peace when we rely on God’s Word. Each day, I seek Him. The Word was first, the Word present to God, God present to the Word. The Word was God, in readiness for God from day one. Take any wood, preferably wood that is not processed, not many Knotts or heavy grain…the grain makes it burn uneven. Pic. Below, started doing the burning, still see the pencil to be done? Notice how I used the grain, used it to go with the pattern in the “Seahourse’s” scales. I also left the round wood grain knot alone and made it like a “sun burst”. If you look at the bottom left corner of the above pic. You will see a panther in pencil. Wood burn over that and You’ll Complete the Project. Show who you are, what you enjoy, express yourself.